Add smart thermostats to the items you can buy on Google Play. 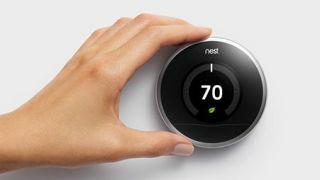 The Nest Learning Thermostat has made its debut on Google's online store, joining the likes of the Nexus 5 and Chromecast on Mountain View's virtual shelves. Google bought Nest in February, and this marks the first time a product from the $3.2 billion (about £1.9, AU$3.4b) company is available from Google directly. Don't look for Nest's other digital home item - the Nest Protect smoke detector - in Google Play any time soon as a glitch that could silence the device halted sales earlier this month. If the Learning Thermostat's $249 (about £179, AU$265) price tag isn't enticing enough for would-be buyers, consider Nest's promise to plant a tree for every unit sold a little Earth Day-motivation. Rock on, hippies. Why is the sky blue? Why is the grass green? And why did Google buy Nest?